You only realize you’re getting old when you start to reminisce a little too much. One of my personal go to complaints is the lack of point-and-click adventure games nowadays. 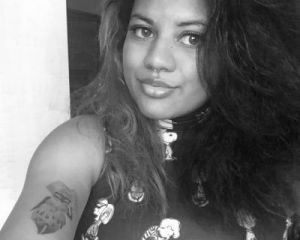 I grew up playing games like Monkey Island, Zork and Grim Fandango and I miss them. Sure, we had some remasters and some more to come, but nothing quite beats delving into a new adventure IMO. In amongst all the AAA titles and VR, I just wanted to give some recognition to a game in the works which could be just what I was looking for. 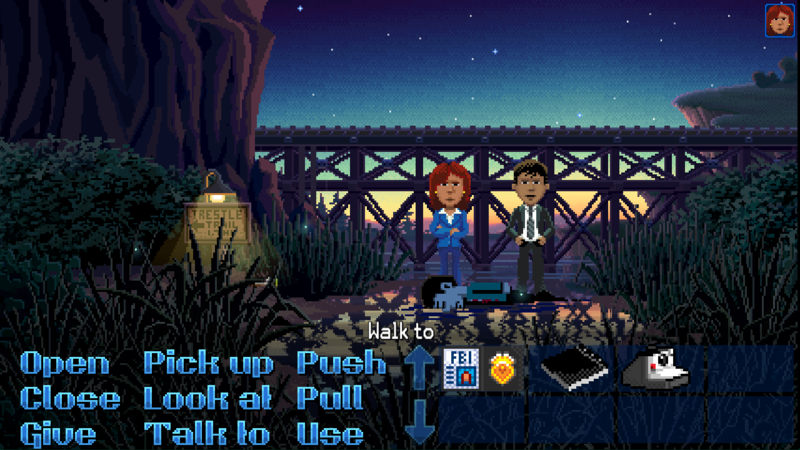 Thimbleweed Park is a Kickstarter project coming to us from the creator of Monkey Island, Ron Gilbert. He works alongside Gary Winnick (Maniac Mansion) and David Fox (Zak McKracken and the Alien Mind Benders) as well as a whole host of ridiculously talented people. Described as ‘opening a dusty old desk drawer and finding an undiscovered LucasArts adventure game you’ve never played before’, TP revisits the classic point-and-click method of head scratching puzzles, witty dialogue, and pixelated goodness. 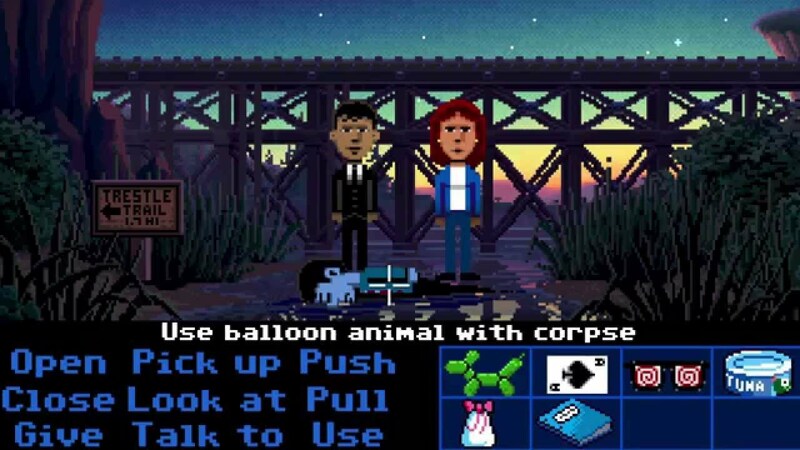 Clearly taking influence from X-Files, Thimbleweed Park follows two detectives who are investigating a dead body and encounter strange inhabitants in the town of Thimbleweed on the way. Much like Day of the Tentacle, you can switch between characters (five in total) and you use your good old verbs (walk, pick up, look) in order to get around. 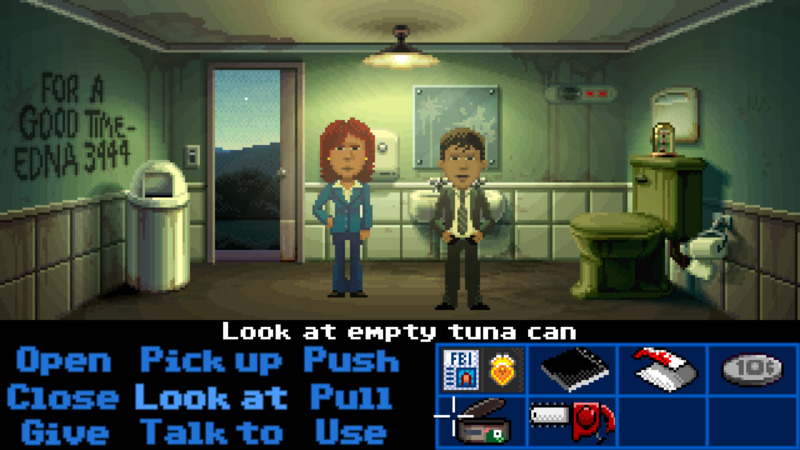 Despite the obvious appeal to retro gamers, there are modern twists that allow Thimbleweed Park to move with the times. The release on multiple platforms allows you to use an analog stick instead of clicking around, the graphics are more colourful and less glitchy and you won’t find yourself stuck at a dead end. These changes are welcomed, I was always worried that I was looking back on these games with rose-tinted glasses and my fears were realised when I played Indiana Jones and the Last Crusade recently. I expected the graphics to be a bit crude, but the main problem was the impossibly hard puzzles and dead ends. Thimbleweed Park is a bit more forgiving, highlighting areas that can be interacted with and allowing you to get hints from fellow characters. The Kickstarter reached its pledge amount back in December, but further pledges contributed to improving the game as much as can be before its anticipated release. Gilbert and the team have been great in updating their backers via the blog, and the excitement (for me anyway) is real. Thimbleweed Park is said to launch no later than January 2017, and will be available on PC/Mac, Xbox One and Linux with mobile versions launching later. Disclaimer: I feel it has to be stressed that I have no affiliation or am receiving any pay for this article, in fact they don't even know I'm writing it. I just REALLY love the idea of this game so felt it deserved some attention, and hope you will too!